Darren Delaney's research is focused on truly understanding the circumstances surrounding truck accidents. 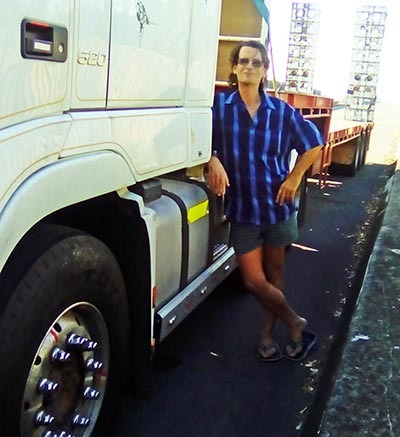 As a newly-licenced truck driver, Darren Delaney was made well aware he was in charge of a ’40-tonne killing machine’ and he’s seen his fair share of close calls and highway mishaps over the course of his career. After decades of interstate trucking and transport management experience, he’s now a freelance consultant who is convinced that accident investigators should be looking further back in time than the few seconds leading up to a crash. “I’m developing a framework for accident investigation that looks at the sequence of events that might start hours, days, weeks or even years before the accident,” he says. “We might have to look into why a factory worker did not take enough care fitting brakes, whether the driver went through family turmoil in the lead-up or whether the transport company has moved its operations base. “Perhaps the sedan driver who stopped suddenly on a yellow light had a recent ticket for running a red light but that does not stop the truck behind him ploughing into the back. “I’m also aware of cyber-crime causing a truck to have brake failure and almost hit a house when someone hacked into the onboard computer. After progressing through CQUni studies all the way from a Certificate IV to undergraduate and postgraduate qualifications, Mr Delaney is now striving towards his Doctor of Professional Studies qualification. In parallel to his doctoral studies, he recently competed in a ‘Falling Walls Lab Queensland’ innovation and creative thinking competition in Brisbane, where he gained positive feedback for his topic about ‘Breaking the Wall of Truck Accident Investigations’.